Getting the RV Ready for Winter! – this luminous life. Getting the RV Ready for Winter! November 24, 2014 ~ Laura N.
Although it was fifty degrees and rainy today, we hit below freezing temperatures last week — it was like Februrary in early November. Too cold, too early. 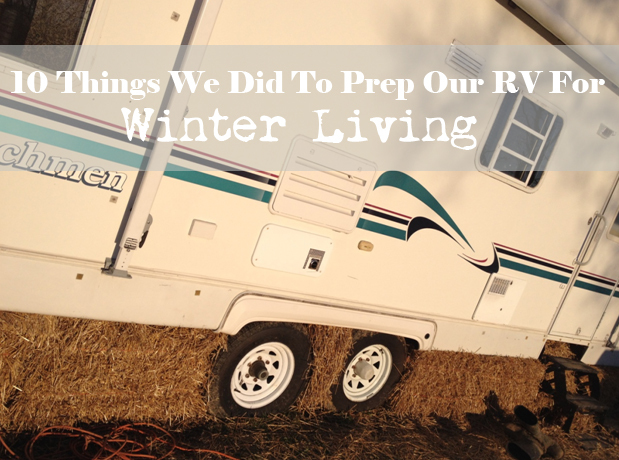 We had to quickly get the RV prepped for colder weather. We knew that winter in the RV would be a challenge — we were just hoping that winter wouldn’t be too long this year. Chicago winters can be long and snowy, but Kentucky winters are typically not as cold and have less snow. Unfortunately, I think we’re in for a long, cold winter. Our budget is also pretty tight right now as we’re still getting settled with everything. 1) Dropped about $100 on 25 bales of straw and stacked them under the RV for insulation. This was our biggest expense and the most time-consuming (Kyle spent about two hours stacking and packing the straw). The purpose of this was to block out all the cold wind that blows under the trailer and keep the floor temperatures a bit warmer. I honestly don’t know if it’s making a difference (the weather has warmed up since we got the bales), but I think it really helps. 2) Plastic sheeting on some of the windows. Just like most people do in their houses. 3) Spicket insulation cap over city water hookup. We disconnected city water and filled our holding tank. The water in the holding tank is still very cold, but at least there aren’t any hoses hooked up that could freeze. And of course, our hot water heater works fine (when one of us dares to go outside to turn it on). We need to fill the thirty-gallon holding tank about once a week; that’s not a big deal….. at least for me. Kyle is the one that goes outside to take care of everything (oh, how thankful I am for him)! 4) Wrapped all grey and black water piping outside with fiberglass insulation wrap. 5) Plastic sheeting around slide-out seam to prevent drafts. Our slide-out seams were soooo drafty! If you put your hand over a seam, you could feel the cold air blowing in. The plastic sheeting helps keep the cold air out and the warm air in! 6) Stick-on door gap insulation on ‘front’ door to block drafts. Our front door was also incredibly drafty — and you could see the outside light coming in through the cracks. A little bit of gap insulation was an easy fix to the problem. 7) Put stick-on insulation around outdoor cubby holes. All the little doors outside that lead to little cubby holes/storage spaces are also places for cold air to seep in and warm air to escape. Insulating them made us feel better. 8) Use a space heater. Space heaters are helpful for heating small spaces when you have enough power to handle them. We did use space heaters for a bit, but unfortunately, the 110 outlet we are hooked up to cannot handle too much wattage (in addition to heat lamp for farm animals). A 220 outlet (as found is RV parks) can handle a space heater just fine. 9) Stock up on propane gas. We do have a heating system throughout the RV that works well. However, since the RV itself is generally poorly insulated, the heater works harder to keep the heat in and we run out of propane gas a couple times a week. It’s a pain. All the steps we took to insulate the RV helped a lot, but it’s not completely airtight. Fortunately, we keep back-up tanks of propane on hand so we’re never completely out of propane while in the process of filling up another tank. Soooo thankful for the farm stores around here that fill up propane tanks! 10) Layers, layers, layers! More clothes! More blankets! Layering up is key. If you can keep yourself warm (even in a regular house), you can cut back on heating costs. We’ve worn sweatshirts and slippers to bed, while wrapped in layers of fleece blankets. It’s sooo cozy, especially with snuggling cats. Consuming plenty of warm drinks and foods is also soothing (and the heat from the stove is nice). So… that’s what we’ve done and we’re hoping it will be enough! Winter, we’re ready for you! !